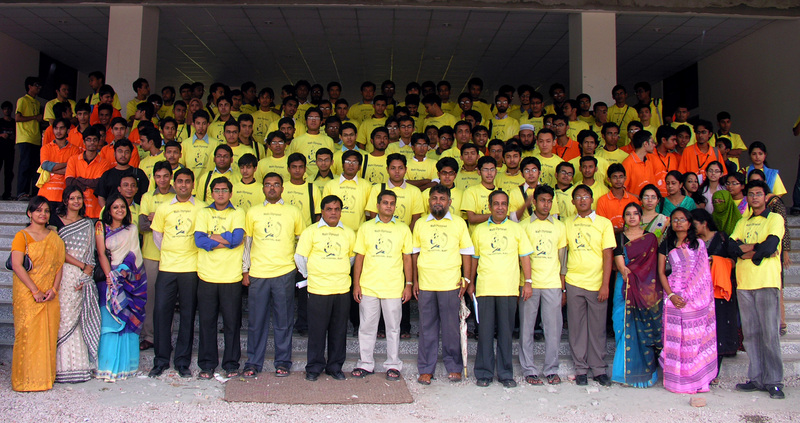 Department of Computer Science and Engineering (CSE), BUET organized an Inter-University Math Olympiad and a National Collegiate Programming Contest (BUET NCPC 2008) as a part of the CSE Festival 2008 on October 24, 2008. About 200 participants from all over the country contested in the Math Olympiad and 52 teams from 30 universities including BUET, Dhaka University, Jahangirnagar University, Rajshahi University, Rajshahi University of Engineering and Technology, Khulna University, Khulna University of Engineering and Technology, Shahjalal University of Science and Technology, North South University, BRAC University, East West University, International Islamic University of Chitagong etc. participated in the programming contest. Each programming team consists of 3 contestants and one coach. BUET NCPC 2008 was sponsored by Microsoft and EyeBall Networks. The Math Olympiad was sponsored by Microsoft alone. The programming contest was inaugurated by Professor Dr. A. M. M. Safiullah, the honorable Vice Chancellor of BUET. Professor Dr. M. A. Rashid Sarker, Dean Faculty of Mechanical Engineering, Professor Dr. Aminul Haque, Head Electrical and Electronic Engineering, Dr. M. Kaykobad, Professor CSE Department, Dr. Muhammad Masroor Ali, Professor CSE Department, Professor Dr. Md. Saidur Rahman, Head CSE Department were present on the occasion. Mr. Farid Ahmed, Education Program Manager of Microsoft and Mr. Shahadat Khan, CTO of EyeBall Networks were present in the ceremony as guests. The program was organized by the teachers and students of CSE department and coordinated by Dr. Md. Humayun Kabir, Associate Professor of CSE Department. Manzurur Rahman Khan (Sidky) has given the full technical support for BUET NCPC 2008. The former ACM world Finalists in the country were the judges of BUET NCPC 2008. BUET Falcon team secured the top position after solving 6 out of 9 problems in the NCPC. DU Knights and NSU Arcturus secured second and third position respectively. The prize giving ceremony of Math Olympiad and BUET NCPC 2008 held on October 30, 2008.